One afternoon when I was really young I accidentally slammed my finger in a door. Now, to a five-year-old, this was a tragedy, and I cried and dramatically stated that my finger would fall off and that the world was coming to an end. My parents assured me that this was not the case, and they put some ice on my finger, and then put on a movie to calm me down. This particular day we had just come back from a video rental store (ah the good old days before Netflix) and we had a new movie in hand called Cats Don’t Dance. This movie cheered me up to no end and I of course forgot all about my injured finger. It was full of song and dance, and bright and colorful animation – everything that could enrapture a kid at that age. We probably re-rented the movie three times more before the rental store inevitably shut down, but I still have that fond memory of that fun cartoon movie that cheered me up when I was little. Now I wouldn’t be surprised if most readers don’t at all recognize this film. I myself did not re-discover it until much later in life. 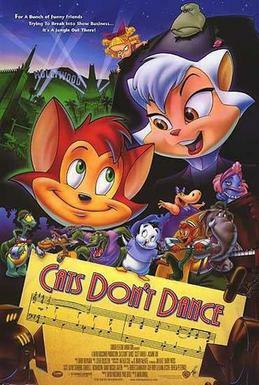 When Cats Don’t Dance came out in 1997, it received generally positive reviews and was the first non-Disney movie to receive the Annie Award for Best Animated feature. It was also the only fully animated feature by Turner Feature Animation (which also did the partially animated film, The Pagemaster), and was directed by a former Disney animator, Mark Dindal. But due to poor advertisement and marketing, and because of a merger between Turner and Time Warner, it majorly bombed at the box office, making only three and a half million dollars to its budget of $32 million, thus causing it to fall into obscurity. But, in the end, was Cats Don’t Dance more deserving of my childhood glee or of its box office failure? The plot is rather simple. Our main character is the naive, yet enthusiastic, anthropomorphic tabby cat, named Danny (Scott Bakula) who travels from his small town of Kokomo to Hollywood where he hopes to hit it big as a movie star. When he gets there he finds that animals are rarely given decent roles in the movies, and all the best parts are given to humans. One human in particular is our main antagonist, the tantrum-throwing, manipulative child actress, Darla Dimple (Ashley Peldon), who despite being dubbed a “lover of children and animals”, will stop at nothing to steal the spotlight and destroy the animals’ careers. Taking place around Hollywood’s Golden Age, this movie is filled with music, dance, and classic movie references (and also lots and lots of animal puns). The music, which was written by Randy Newman, is rather fun and upbeat but at the same time seems pretty generic and at times forced. The supporting characters are an animal cast including a fish voiced by Cruella de Vil (Betty Lou Gerson), an elephant voiced by Gimli (John Rhys-Davies), and a turtle voiced by Don Knotts (…Don Knotts). 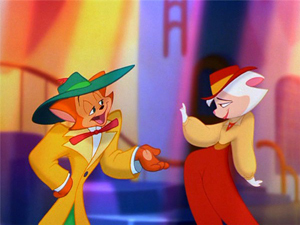 There’s also the female cat, and love interest of our main character, named Sawyer (voiced by Jasmine Guy), who gets her own classy dance and song routines (sung by Natalie Cole). The characters don`t really have a lot of depth to them outside basic quirks and personality traits. You have the old cranky guy, the scared guy, the happy one, the cute one, and the aforementioned love interest, who acts as the cynical foil to Danny’s unbridled optimism. But let me take a moment to talk about Darla Dimple. Darla is perhaps one of my favorite animated villains. Just like her need to be the center of attention, she manages to steal the spotlight in this movie. Her bratty outtakes, exaggerated reactions, and downright villainous moments, make her someone you will just love to hate. An obvious parody of the cute child star, Darla loves to be adored, and will do dastardly deeds to those who stand in her way of hogging the silver screen. She also has a giant butler (and I literally mean giant) named Max who is also a great addition to the villain cast, and what he lacks in coherent dialogue, he makes up for in presence and intimidation. The way Darla is animated is also brilliant, always moving through several facial expressions at once, going from adorable and innocent one moment to the look of some Dr. Jekyll-esque mad scientist in the next. There’s one great scene where she is talking with Danny while eating a bowl of animal crackers, specifically taking care to bite off only the head of each cracker one by one. The animation of Cats Don’t Dance is as a whole pretty well done. It is very colorful, and the palette shifts dramatically depending on the scene and mood. It’s also very dynamic and something is always going on in each scene which draws your eyes to the screen. It has that cartoony exaggeration and those visual gags that makes it fun to look at. There is a lot of motion between frames which adds a lot of action to even mundane scenes and conversations. Certain lines of dialogue are timed well with the visuals, adding to some comic moments. The animators knew where to leave no space or pause in order to pack in as much stuff as they could, but they also knew where to calm down a little. However, if I’m being truly honest, this movie isn’t the greatest. In fact, at most it’s okay. It doesn’t try to do anything special and there’s not a whole lot of depth to take away from the story. You could try to pick apart how the animals working as second class citizens is akin to racism (or specie-ism? ), but I don’t think it’s really trying to push a message there. If anything, it is mainly about following your dreams and not giving up despite the obstacles in your way. Rather generic, and nothing you wouldn’t see in your average kids film. As I said, the cast (with the obvious exception of Darla) is rather bland and cookie-cutter, even if they are amusing. And Danny is at times way too darn optimistic, especially to the point that where his optimism feels like a plot device. The music may get you pumped up for watching a particular scene, but isn’t as memorable as most Disney movies’. But you might have noticed that I’ve used the word “fun” several times in this article, and that is not without reason. This movie is fun! From the animation, to the characters, to the music, I still find Cats Don`t Dance a fun watch. Part of that opinion might come from the nostalgia I have for it, and I understand that not many people had this film as a part of their childhood as I did. But I feel like it was just a stroke of great misfortune that this is the case, and is not rightly deserved. It was an animated film from a studio that didn’t really do animated films during the era of Disney’s Renaissance. No wonder it didn’t do well. Maybe if it had better marketing and a bigger company behind it, it would have been remembered more. Cats Don’t Dance is very much a kid’s film, but I`m glad I found it as a kid, and then again as an adult. Maybe it’d be a good feature to show to your kids, if you have kids. Or maybe you could watch it right now as an adult, and tickle the child inside. Must watch! My inner child wants to be tickled no matter how creepy that sounds.